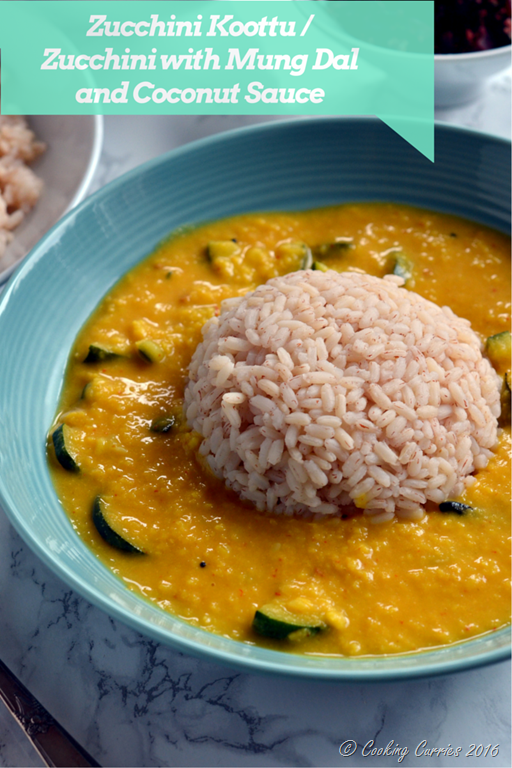 Protein rich and flavor packed koottu / kootu recipe with Zucchini. Vegan and Gluten Free. 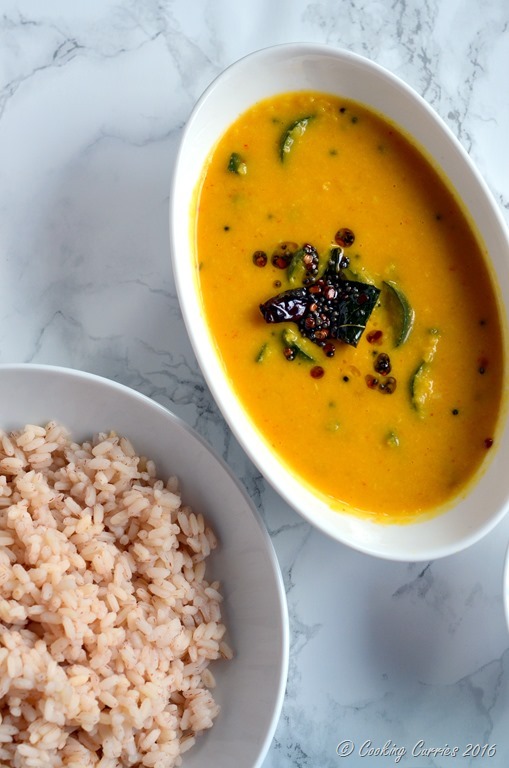 Koottu / Kootu is a dal recipe from Southern India where we also add some coconut ground with cumin and chillies to the dal with vegetable(s). This is a very versatile recipe where you can add pretty much any vegetable or combination of vegetables. My favorite vegetables to add to this are spinach, chard, cabbage, a combination of carrots, potatoes and chayote squash. This is my first time trying zucchini and I just loved it! It is so much easier as I always buy a lot of zucchini or have leftover from something else I planned to make with it. It is quite filling as it is protein packed with dal and will keep you full for a long time. A great way to eat this would be with rice, a sauté of some vegetables and fried pappadums. This is a very typical lunch combo that I grew up with. And the best part is that the leftovers from lunch are used instead of a regular dal side for rotis. Rinse the dal a few times with water and cook in about 2 1/2 cups of water till it becomes cooked through and gets mushy. Add more water if required. Meanwhile, wash the zucchini and cut it in half lengthwise and then cut out half-moon slices from it. Add this to the cooked dal and let it cook. Grind together the coconut, cumin seeds and dried red chillies to a fine paste. Add this to the dal- zucchini mixture and let is come to a boil. Add more water at this point if needed. Add salt and mix well. Remove from heat. Heat the oil for tempering in a small saucepan and add the mustard seeds to it. Once they splutter, add the urad dal and wait for it to turn lightly brown. Switch off heat and add the washed curry leaves and the dried red chilli. Pour this over the dal and mix it in before serving. Note: Use freshly grated coconut or fresh grated coconut that is frozen – can be found in Indian stores / Asian stores. If using frozen coconut, microwave for 30 secs before grinding, even if it is thawed completely. 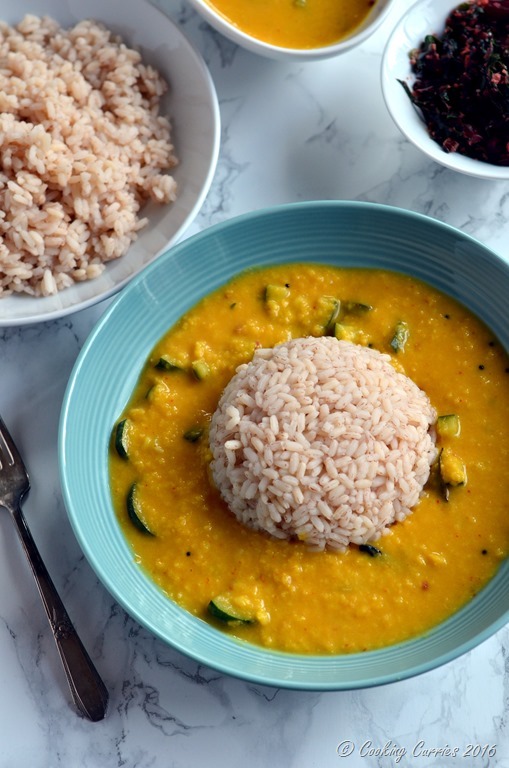 Protein rich and flavor packed koottu / kootu recipe with Zucchini. Vegan and Guten Free. Use freshly grated coconut or fresh grated coconut that is frozen – can be found in Indian stores / Asian stores. [br]If using frozen coconut, microwave for 30 secs before grinding, even if it is thawed completely. This dish looks like comfort food! I love that it has cumin, coconut and red chilies. A bit of smoke, sweet and heat-delicious! Yes, you described it right – a little bit of all that and whole lot of heartiness! ? I just got some Tumeric for Christmas and can’t wait to try this!! 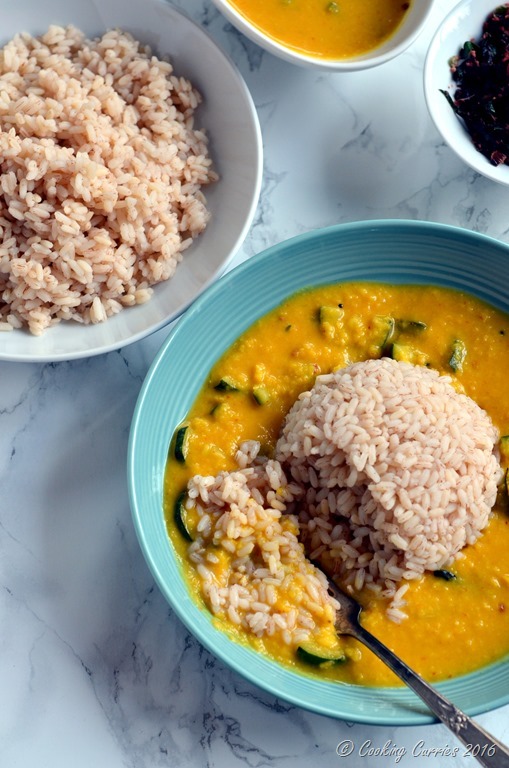 I love dal and vegetables! Beautiful post and photos! I love lentils! This sounds like such a delicious lunch recipe to make for the family! Those colors are beautiful, too!